In this ever-changing, ever-moving realm of technology, consumers are demanding more and more from their service providers and network operators. It is no longer enough to offer the commodity service. These providers must now be able to meet changing demands, deliver rich content applications, stream music and video and so much more on any device and at any time. An inability to do these things better than the competition will drive customer churn. For those service providers and network operators hoping to stay in business, they must find a way to reduce that churn and grow the base. One of the most effective ways to reduce and even prevent churn is to create high-value services and applications that customers want and make them available on multiple devices. Of course, one of the biggest challenges for the service provider hoping to meet these increased demands is the fact that budgets are more constrained and there are increased concerns for the return on capital invested on any solution. These companies are scrutinizing every decision, attempting to do more with less. While this may make good business sense, it can also slow time-to-market and increase customer churn. The key to turning this around and ensuring that all decisions make good business sense while continuing to move strategies forward; the service provider needs to gain access to key market intelligence and proven business modeling techniques. This can ensure they have the confidence they need to drive proven results. To gain this powerful edge in the market, the service provider or network operator would do well to partner with a proven provider. One option that has proven to deliver results is the Cost Transformation Program from Alcatel-Lucent (News - Alert). To deliver the market intelligence service providers need to drive effective solution delivery and reduce churn, Alcatel-Lucent draws on extensive experience to offer comprehensive business modeling, testing, launch and go-to-market strategy services. With the Cost Transformation Program in place, the service provider can make the rational decisions necessary to reduce costs and make cash available for new solutions that will deliver the needed and sustainable value for the long term. Such delivery is what customers expect and demand; it is also what will keep the service provider on a positive track for success. In today’s market, customers are impatient and switching is very easy. To protect the current customer base and continue on a path for healthy growth, the service provider needs a proven plan in place. Leaning on the Cost Transformation Program from Alcatel-Lucent could be a step in the right direction. 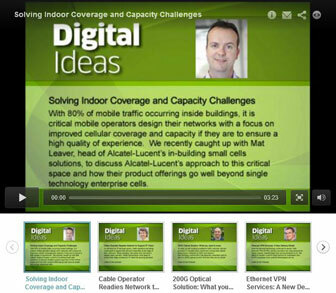 Alcatel Lucent - A New Era Of Mobile Backhaul.